Judge Quentin Brown raised in Birmingham, Alabama, attended Shades Valley High School, The University of Alabama and the Cumberland School of Law. Judge Brown served as an Assistant Attorney General for the State of Alabama until 1976 when he entered private practice in Birmingham. In 1982, at age 35, he campaigned for and won election to the District Court of Jefferson County, Civil Division, and was subsequently elected to serve two additional terms. During his tenure as District Court Judge he was selected by his peers to serve as the President of the State District Court Judges Association. He also served on the Supreme Court of Alabama's Rules of Civil Procedure Committee. After retiring from the bench in 2001, Judge Brown established a Mediation Center providing mediation/arbitration services throughout the State of Alabama. Judge Brown has participated, both as a student and teacher, in well over 200 hours of mediation/arbitration training, including being selected to participate in a 40 hour course at Harvard University in October 2006, serving as group leader in the section on advanced mediation and negotiation training. 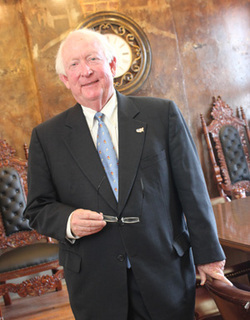 In pursuit of his interest in mediation/arbitration, Judge Brown has served on the Alternative Dispute Resolution Committees with the Jefferson County Bar Association, the Alabama Bar Association and the American Bar Association. Judge Brown has mediated cases nationally including work on both the Daewu bankruptcy as well as the General Motors bankruptcy cases. He is currently completing a three year term as a member of the Unsecured Creditors Committee of the GM bankruptcy. Recently, Judge Brown has expanded his law practice through addition of staff and associates and has moved his offices to the historic downtown Birmingham business district. Judge Brown and his wife, Julie, are animal lovers. They have three cats and are supporters of the Birmingham Humane Society.